Hearty breakfast pizza with biscuit dough and sausage gravy, topped with potatoes, egg and cheese. In a large bowl, mix together flour, baking powder, salt and sugar. Cut in the shortening, then slowly add the milk. Mix until the dough starts to pull away from the sides of the bowl. Turn out onto a lightly floured surface and knead for 1 minute. Roll out to a 1/2-inch thickness and place into a 9-inch ungreased pan. Bake for 8 minutes. In a skillet, melt butter. Brown meat and seasonings, then add flour; cook for 2 minutes. Slowly whisk in heavy cream and milk, adding more milk if necessary to reach desired gravy consistency. Season to taste with salt and pepper. Pour over crust. In a small sauté pan, scramble eggs over medium heat. Add to crust, the eggs, potatoes, cheese and green onions. Bake for 5-8 minutes or until crust is browned and cheese is melted. 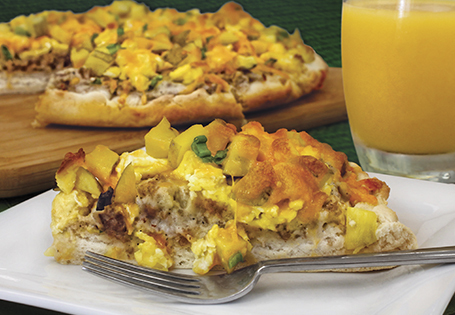 TIP: Use this recipe to make two thin crust breakfast pizzas.